Cue the Rocky theme music. Dealer Roque De La Fuente, 61, also known as Rocky, is running for president. Of the United States. He's on the primary ballot in at least three states, and is stumping in Iowa as a conservative Democrat. His platform includes welcoming immigrants and a two-tier flat tax: 10 percent for most, 12 percent for those who itemize deductions. But it's an uphill challenge like the one Rocky Balboa faced in the original movie in the series. 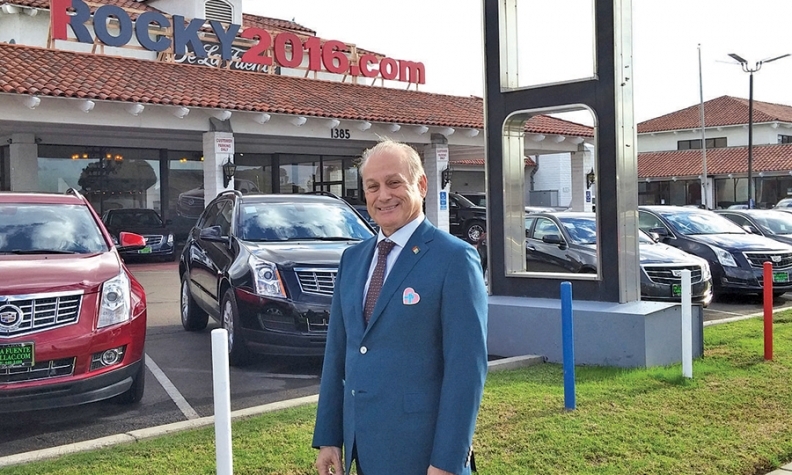 The owner of De La Fuente Cadillac in El Cajon, Calif., has a few things going for him as he tries to sell voters on his candidacy. He knows how to sell -- cars, at least. He doesn't back down from a fight. And he views auto retailing as a great school. He spoke with Staff Reporter Leslie J. Allen about his history and plans. Q: Your father was a Dodge and VW dealer in California, right? A: I grew up in the Volkswagen business. My first job was in the parts department, getting acid into the batteries. Eventually, one thing led me and my father to bump heads. He's the smartest person I've ever met, but unfortunately, when you have two alphas with the same first name, same last name -- sometimes something has to budge. I basically was fired because I was disrespectful to my father. And my father was probably correct. You then worked at an early Toyota store. How did that go? Does anyone remember [the 1974 Toyota] Chinook? It was a pickup [with] a camper on top. You could not give them away. At that time, you were able to finance [cars] for 30 months, but because this qualified as a motor home, Bank of America gave you 60-month financing. The store's old-timers would take all the ups. "I get the first up; you get the second up; Rocky, if there's an eighth up, you get it." But they would not take a Chinook. I saw this couple. They came in to buy a Toyota SR5 [pickup], but they started looking at the Chinook. So I put them inside the camper, and I told them what's important in life is not how hard they work or what they do. They need to enjoy the weeks they get off. They could do it in a Chinook, and it's going to cost them the same as an SR5, $150 a month, with one exception: it's for 60 months versus 36. First month I was there, I sold eight Chinooks. Nobody could believe it. I had no choice. I had to survive. Next month, I sold the last six Chinooks. I got rid of the inventory. I earned my stripes. So you took on the old-timers. You then worked at and acquired other franchises -- and took on the factory. Cadillac came up with a diesel car. The car only lasted 34,000 miles, and people came to the dealership asking for the engine to be replaced. It was covered under warranty. General Motors did not honor the warranty and got me stuck with the bill. They owe me, in 1982, $242,000. So I took them to small claims [court] one at a time. I won the first one. A week later I took a second one. I took them 17 times to small claims. [Eventually, a GM executive asked,] "How much do we still owe you?" "You owe me about $141,000." "What does it take to settle it?" "Done. I got better things to do than to go to small claims." You sued again when GM threatened to take away your franchise during its bankruptcy. All of a sudden, I get a beautiful letter from [GM] saying, "We changed our mind; we ain't going to take your franchise away." They didn't change their mind; I earned it the old-fashioned way. I defended myself. Like I'm going to defend this country. How many franchises have you held at once? Maximum was probably in 1982. I probably had 24. How did you whittle it to one? In the 1982 recession, out of all  franchises, four were making money. I did not go broke. I survived. While everybody was firing employees, I kept my crew together. We had to negotiate -- fringe benefits, hours of operation. I had to talk to each of them individually, because I was going to take some of their health care out, but folks, it was not a matter of what I wanted to do. It was survival. They're not your friend. They never have been. They try to give you the dogs, and if a car is hot, they think they're prima donnas. And they play games, with allocation, with everything. You have to outsmart them. I don't care about Harvard. I don't care about Stanford. The best university in the world is an automobile dealership. How do you view Cadillac today? I love the franchise. Finally they're making good cars. The Escalade is an unbelievable automobile, but you need to have an allocation system that's fair. You need to know how many vehicles we're going to get in a year. So do I think Cadillac is going to make it? Yes.